Oil on canvas in old reproduction frame of appropriate type. This superb portrait of the beautiful young Lady Anne Campbell is one of Dahl's most sensitive and gentle portraits of a woman. She wears none of the accoutrements of her rank...the usual fashionable pearl ear pendants and necklace are absent. She looks pensively out at the viewer, holding in her right hand, a sprig of jasmine, which, in the language of flowers, symbolises amiability of character. Unlike the swagger and confidence depicted in most three quarter length portraits of the period here Dahl suggests innocence and vulnerability. This portrait is a fine example of the artist’s eloquent depiction of aristocratic women. In terms of both draughtmanship and pose Dahl’s female portraits are noticeably softer and gentler than Kneller’s, and thus allow for a greater versatility in the expression of feminine beauty. Dahl’s works are frequently distinguished by a greater attention to the character of the sitter than those of his rivals, and he particularly allowed a softer aspect to the surfaces of his sitter’s costume and drapery. His colours are silvered and luminous, and there is a great charm and sensitivity in the overall expression of the sitter. In this example, the drapery and sitter’s turned head impart a subtle sense of movement. 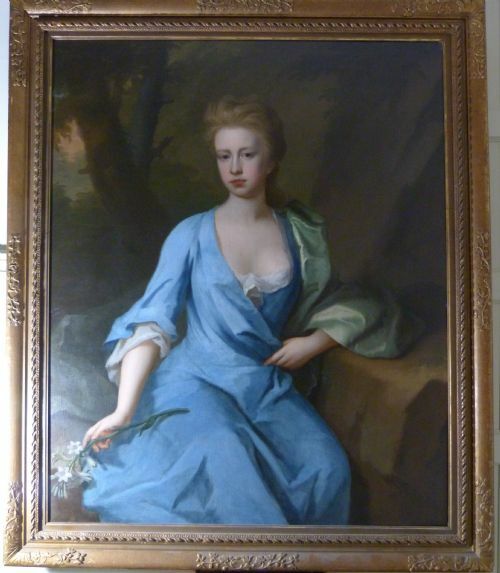 LADY ANNE CAMPBELL (c.1696-1736), daughter of Archibald Campbell, 1st Duke of Argyll. Lady Anne, the youngest of three children by Campbell's wife Lady Elizabeth Tollemache, married James Stuart, 2nd Earl of Bute (1696-1723) in 1711, becoming Lady Anne Stuart, Countess of Bute at the age of 15 - 17. She bore him eight children. Upon his death in 1723, she married Alexander Fraser, 7th Baron of Strichen, in September 1731. Anne died in 1736, aged 40, and her husband died c.1775. Dahl was a painter of exceptional talent and regarded as the only really serious rival to Sir Godfrey Kneller, for royal patronage, during the years 1690-1714. Dahl's patterns were undoubtedly indebted to the fashion set by Kneller, but Dahl had a lighter palette, his brushwork applied in shorter and more careful strokes. SIZE: 57 x 48 inches inc. frame. *Reynolds Gallery, Barbican, Plymouth, sold 1980, as by Dahl. *Lawrences, Crewkerne, Somerset 2004, as by Dahl. Oil on canvas in a good carved and giltwood frame. The sitter, possibly Elizabeth Trentham, holds, by its chain, a very fine and costly watch; the significance of this is not clear. It is most unusual for a female sitter to be shown with such an item...does it represent the inevitable passing of time? Was it the cherished possession of a deceased male relative? Attached to it is a black ribbon, symbol of mourning. 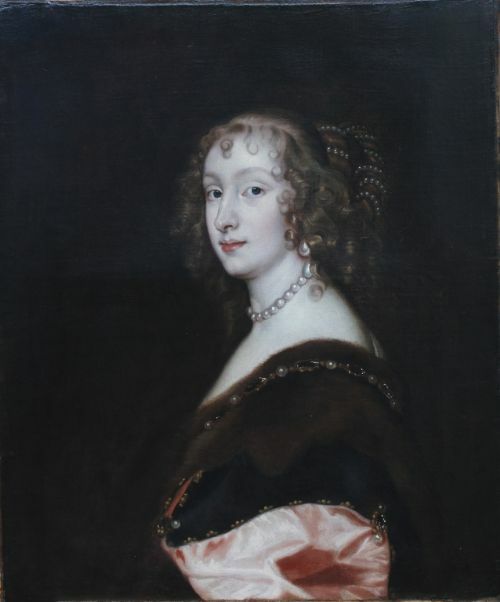 Regardless of the identity of this lady this is a high quality portrait by an artist strongly influenced by Lely's style of the early 1660s, to the extent of showing the sitter's left hand raising the material of her dress, as Lely often depicted his sitters doing; witness his portraits of Catherine of Braganza, Diana, Countess of Ailesbury and Frances Teresa Stuart. 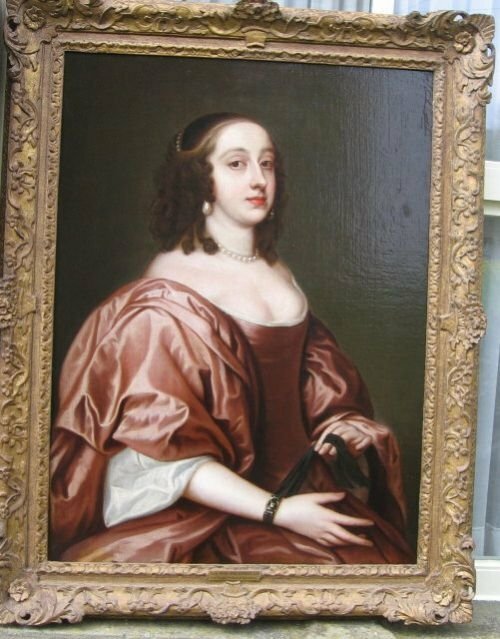 Elizabeth Trentham was born in 1640, she was the daughter of Francis Trentham. She married Brien Cokayne, 2nd Viscount Cullen of Co. Tipperary, son of Charles Cokayne, 1st Viscount Cullen and Lady Mary O'Brien, before 1 April 1657. She became Lady of the Bedchamber to Queen Consort Catherine. She died on 30 November 1713. SIR PETER LELY (1618 - 1680) was the most important portraitist in the reign of Charles ll, although he had painted portraits throughout the Commonwealth. Dutch born as Pieter van der Faes, he became Principal Painter to the King, painting everyone of importance and maintaining a busy and active Studio to help with the huge demand for his portraits. Members of his Circle, many of them talented artists in their own right, emulated his style to supply this constant market. SIZE: 55 x 46.25 inches inc. frame. Verso: fragmentary old Parisian storage label and two inventory numbers. Lady Killigrew here gazes out at the viewer directly. By the late 1630s, van Dyck seems to have devised for his female portraits a less specifically fashionable form of dress. Clearly the prestige of being painted by him was such that his sitters were prepared to accept this. Mary is shown in just such a gown – simplified, and minus the kind of richly textured lace that was so time-consuming to paint – and which has thus become a ‘timeless’ version of contemporary dress. It is clear that van Dyck had absorbed ideas from Venetian painters. Van Dyck maintained a busy studio; he had a number of talented assistants to help meet the demand for his work. Working under his eye they would produce copies of his portraits if more than one was required. MARY HILL (c.1610 -1686) was the daughter of John Hill of Honiley, Warwickshire. She married Sir William Killigrew, son of Sir Robert Killigrew and Mary Wodehouse, in 1626. Sir William Killigrew (1606-1695) was a courtier to Charles I, and also later a playwright. 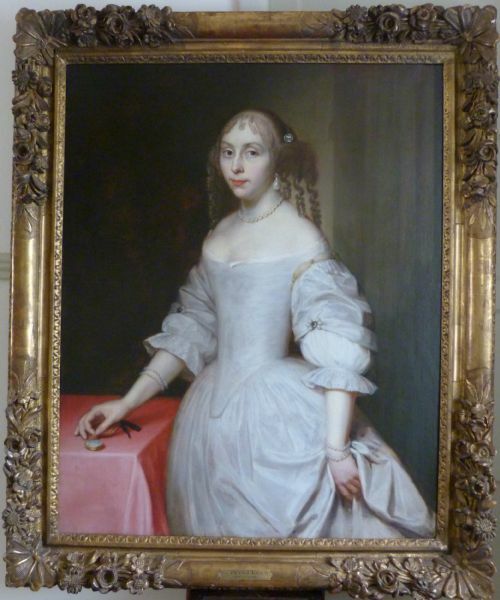 Mary was a dresser to the queens Catherine of Braganza and Henrietta Maria. William Killigrew was knighted by Charles I in May 1626 – probably shortly after his marriage to Mary Hill. They took a Grand Tour of Europe before Sir William was elected M.P. for Newport and Penryn in Cornwall, and appointed Governor of Pendennis castle and Falmouth Haven. He was made Gentleman Usher to King Charles I, studying with him at Oxford and commanding one of the horse troops that guarded the King during the Civil War. The couple were to have seven children in all. As Royalists, the couple were forced by poverty to live apart during the Civil War and Commonwealth period. They were re-united at the Restoration of the Stuart monarchy in 1660, when Sir William regained his earlier court post and Lady Mary became dresser to the dowager Queen Henrietta-Maria. SIR ANTHONY VAN DYKE (1599-1641) was the greatest master of the European baroque portrait. Born in Antwerp, he first visited England in 1620. In 1632 he entered the service of King Charles I as Court Painter, and was knighted in 1633. His clientele was essentially the aristocratic circle of courtiers, many of whom lived in a romantic Royalist dream world which collapsed in ruins in the Civil War, soon after Van Dyck's death. Sir Anthony Van Dyke's influence on the art of the portrait is almost beyond measure. PROVENANCE: With Philip Mould (Historical Portraits). Oil on canvas in a fine quality carved and giltwood frame. In 1949 Christie's stated that the portrait was signed and dated 1739, lower left, and in the entries in the two reference books mentioned below the same statement is made, and again stated in an old handwritten label verso. However, now only some faint marks can be seen. This excellent portrait is typical of the best work of Heins. The sitter, Thomas Wright of Wighton, Norfolk, looks confidently out at the viewer, his tricorne hat held as if just removed to courteously greet us....the very model of a fashionably and expensively dressed gentleman of the early Georgian era. There is an elegant swagger to the pose, but no bluster; a gracious dignity was paramount at this time. Even so, Thomas has taken care to sweep back his coat to display the large quantities of silver lace on his silk waistcoat. His silver hilted sword, the mark of a gentleman, is also on discreet display. Thomas married Anne, the daughter of the Reverend William Wilson, Rector of Stiffkey. Their daughter Anne married Captain Thomas Lee Warner of Walsingham. 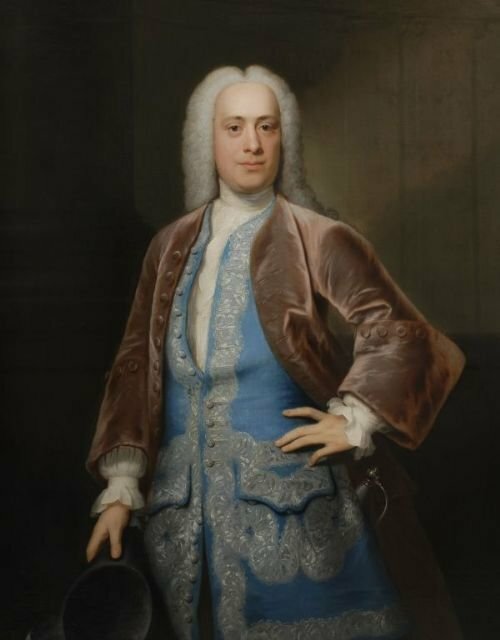 Thomas Wright died in 1762, 23 years after Heins painted this portrait. His death was announced in 'The London Magazine, or, Gentleman's Monthly Intellegencer'. JOHN THEODORE HEINS (1697-1756), also known as Dietrich or Dirk, was born in Germany. He settled in Norwich (at that time a city second in importance only to London) in 1720. He made a good living painting the local prosperous merchants and gentry and was accepted into their social circle. His style was influenced by that of Thomas Hudson. Many of his finer works were commissioned by the Astley family of Melton Constable. Heins died in Norich and his will was proved 30 August 1756 by his widow, Abigail. His son, also called John Theodore Heins was also a portraitist but lacked his father's talent. Heins senior's work is in Norwich Castle Museum, Felbrigg Hall (National Trust), the National Portrait Gallery, Cambridge University and others. SIZE: canvas 50 x 40 inches. PROVENANCE: *Sold: Christie's, London 7 October 1949. *The Collection of a Titled Lady, East Sussex. *Collection of a Fellow of a Cambridge college. *A photograph of this portrait appears on page 167 of 'The Dictionary of British 18th Century Painters' by Ellis Waterhouse, and also on page 242 of 'The Dictionary of Portrait Painters in Britain up to 1920' by Brian Stewart and Mervyn Cutten. See Image 5. VERSO: old handwritten label: "Thomas Wright, Wighton, Norfolk. M. Anne dau. of Revd. Wm. Wilson, Rector of Stiffkey. Their daughter Anne married Capt. Thomas Lee Warner of Walsingham. Oil on canvas; unframed; recently cleaned, lined and restretchered. The pose was one used by Netscher previously; the body, drapery and background are based on a portrait of the sitter's daughter-in-law Queen Mary II (now in the Hermitage Museum, St. Petersburg). MARY OF MODENA (Maria Beatrice Anna Margherita Isabella d'Este; 1658 – 1718) was Queen of England, Scotland and Ireland as the second wife of James II [England] and VII [Scotland], (1633–1701). Mary Beatrice had wanted to join the convent for the Sisters of the Visitation, which was next door to the Modena’s castle. But she had to marry the widowed James, who was the younger brother and heir presumptive of Charles II. Throughout her life, she was first and foremost a devoted and pious Catholic. 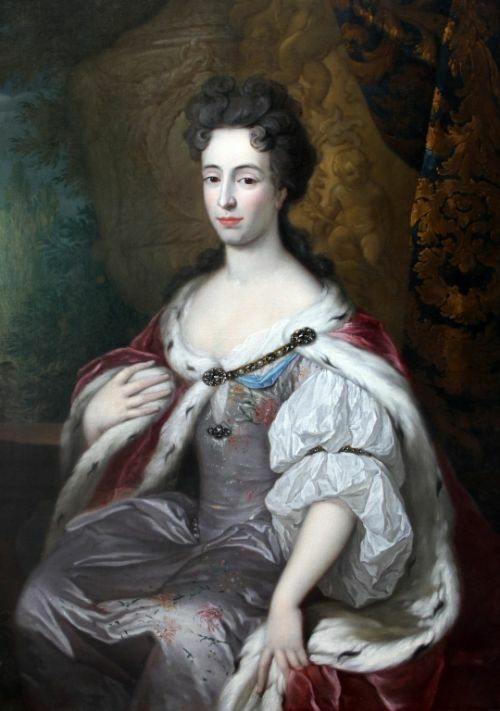 She was uninterested in politics and devoted to James and their children, two of whom survived to adulthood: the Jacobite (previous Roman Catholic/Stuart dynasty) claimant to the thrones, James Francis Edward, (who would have become James III of England, but later in life known as "The Old Pretender"), and Louisa Maria Teresa. Born a princess of the northwestern Italian Duchy of Modena, Mary is primarily remembered for the controversial birth of James Francis Edward, her only surviving son. It was widely rumoured that he was a "changeling", brought into the birth-chamber in a warming-pan, in order to perpetuate her husband's Catholic Stuart dynasty. Although the accusation was entirely false, and the subsequent Privy Council investigation only reaffirmed this, James Francis Edward's birth was a contributing factor to the "Glorious Revolution", the revolution which deposed James II and VII and replaced him with his Protestant eldest daughter from his first marriage to Anne Hyde, (1637–1671), Lady Mary, (later Queen Mary II). She and her husband, William III, Prince of Orange-Nassau, would reign jointly on the English Throne as "William and Mary". Exiled to France, the "Queen over the water" — as the Jacobites called Mary — lived with her husband and children in the Château de Saint-Germain-en-Laye, provided by King Louis XIV of France ("The Sun King"). Mary was popular among Louis XIV's courtiers; however, James was considered a bore. In widowhood, Mary spent much time with the nuns at the Convent of Chaillot, where she and her daughter Louisa Maria Teresa spent their summers. In 1701, when James II died, young James Francis Edward became king at age 13 in the eyes of the Jacobites, as now "King James III and VIII". As he was too young to assume the nominal reins of government, Mary acted as his regent until he reached the age of 16. When young James Francis Edward was asked to leave France as part of the settlement from the Treaty of Utrecht in 1713, which ended the War of the Spanish Succession (1701–1714), Mary of Modena stayed, despite having no family there, daughter Louisa Maria Teresa having unfortunately died of smallpox. Fondly remembered by her French contemporaries, Mary died of breast cancer in 1718. CASPAR NETSCHER(1639-84) was a Dutch portraitist of Holland's Golden Age of painting. In his early career at The Hague, where he settled in 1651, he also painted genre and religious scenes; but from c.1670 onwards he devoted himself exclusively to the portrait, often of Court members in The Hague, earning a considerable fortune. His reputation was so highly regarded that he was invited to England by King Charles II. Netscher worked elegantly and with a slight French influence, his paintings exquisitely finished and influencing Dutch portraiture into the 18th century. Oil on oak panel in an elaborate carved and giltwood frame. 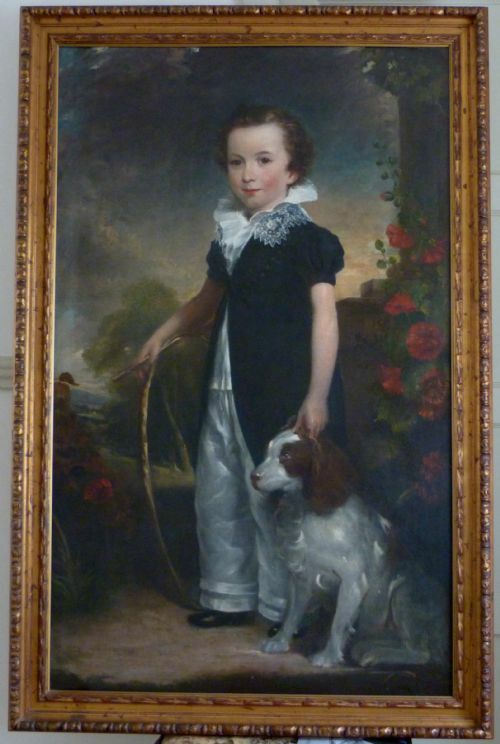 Created c.1800 this is a superb portrait convincingly painted in the Tudor manner. Verso, an old handwritten label "Anne Boleyn, (after) Holbein". In fact this is a portrait of Mary Tudor, later Queen Mary I, as a young woman. Mary was noted for her fierce Catholic faith, and in this portrait can be clearly seen symbols of that faith; a bible, a jewelled cross and a jewel showing St. Veronica holding the cloth with the image of Christ upon it. 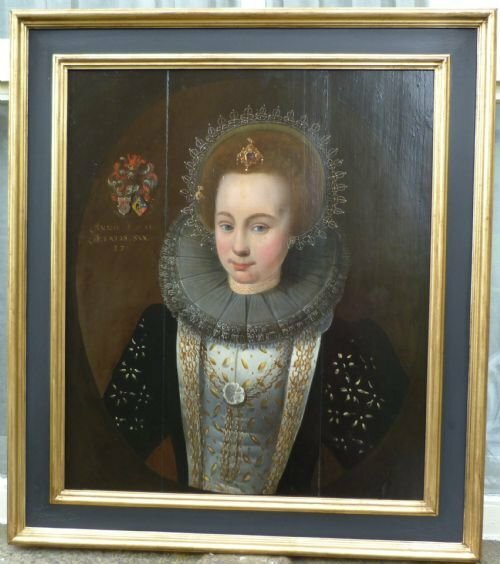 The unknown artist of this lovely painting has been directly influenced by Guillim Scrot's portrait of the young Elizabeth I in the Royal Collection at Windsor castle. 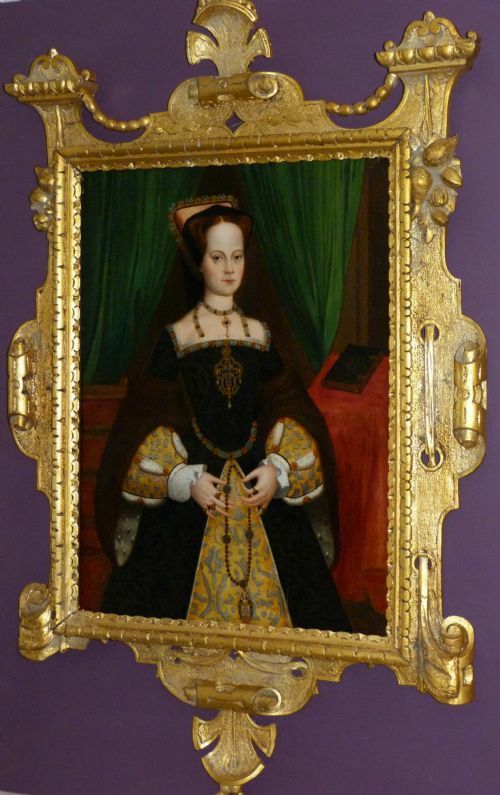 Also the placement and composition of the hands in the portrait of Catherine Parr in the Melton Constable portrait (formerly mistakenly called Lady Jane Grey) seem to have been utilised in reverse. MARY TUDOR was the first Queen Regnant (that is, a queen reigning in her own right rather than a queen through marriage to a king). Courageous and stubborn, her character was moulded by her early years. In his political and marital manoeuvrings her father Henry VIII instituted an Act of Parliament in 1533 which declared her illegitimate and removed her from the succession to the throne (she was reinstated in 1544, but her half-brother Edward removed her from the succession once more shortly before his death), whilst she was pressurised to give up the Mass and acknowledge the English Protestant Church. On her succession Mary restored papal supremacy in England, abandoned the title of Supreme Head of the Church, reintroduced Roman Catholic bishops and began the slow reintroduction of monastic orders. Mary also revived the old heresy laws to secure the religious conversion of the country; heresy was regarded as a religious and civil offence amounting to treason. As a result, around 300 Protestant heretics were burnt in three years. Apart from making Mary deeply unpopular, such treatment demonstrated that people were prepared to die for the Protestant settlement established in Henry's reign. The progress of Mary's conversion of the country was also limited by the vested interests of the aristocracy and gentry who had bought the monastic lands sold off after the Dissolution of the Monasteries, and who refused to return these possessions voluntarily as Mary invited them to do. Mary's decision to marry Philip, King of Spain in 1554 was very unpopular. Popular discontent grew when Calais, the last vestige of England's possessions in France dating from William the Conqueror's time, was captured by the French in 1558. GUILLIM SCROTS (Guillim Stretes or William Scrots) (active 1537-1553). Nothing is known of his early life, training or parentage, but in 1537 William Scrots was appointed painter to Mary of Hungary, Regent of the Netherlands. In 1545, he went to England to take up a position as a painter at the court of Henry VIII, where he was the highest paid artist of the time. SIZE: Panel 25.25 x 19 inches. Frame 44.25 x 28.5 inches. PROVENANCE:From the old collection of an ancient noble Scottish family. Oil on canvas in giltwood period frame. 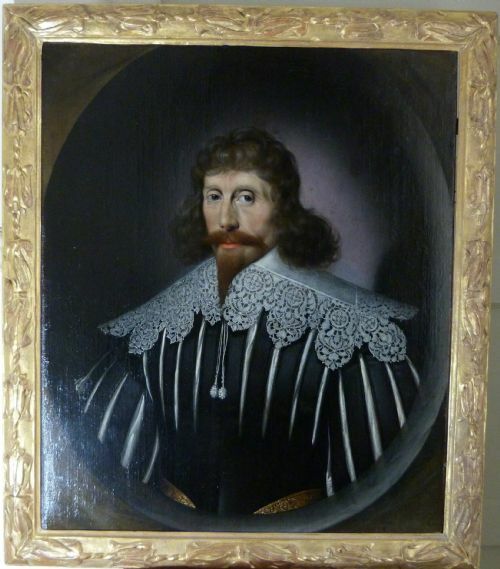 This sensitive portrait of a gentleman, perhaps a nobleman, is typical of Johnson's best work. The sitter has a pensive appearance...looking at the artist, but his thoughts seem far away. CORNELIUS JOHNSON (Jonson, Jansen, Van Ceulen), 1593-1661, was one of the most gifted and prolific artists working in England in the 1620s and 1630s. Born in London but of Flemish and German extraction, he is thought to have trained as an artist in the northern Netherlands before establishing himself in England around 1618. This portrait was painted about 1635, at the height of his popularity, and three years after he was appointed as ‘his Majesty’s servant in ye quality of Picture drawer’ to Charles I. It is a compelling example of Johnson’s restrained, intimate portrayals for which he was renowned, and shows characteristic attention to detail in a style and pattern that Johnson had perfected by the 1630s for his half-length portraits. His portraits are very sensitive to character, beautifully drawn and meticulously painted. Johnson always preferred the feigned oval, suggestive of miniatures, of which his own began in 1625. In a period when black clothing was the fashion (a dense black being very expensive to obtain) artists strove to depict the different nuances and textures of the fabrics as convincingly as possible. They found that black is an ideal background with which to contrast the crisp white linen and rich lace and this dramatically accentuates the face and hand gestures. This extreme opposition between black and white is both austere and exciting, and is a characteristic feature of portraiture of this period. his detail on this close up is almost photographic. It shows how fine the lace and linen of the falling band actually is and an indication that the slashes have been finished off with very small hems by the tailor to avoid fraying. Johnson is the most satisfying and 'English' of the portraitists working in England in the 1620s and 30s. He has a fine technique with a restrained and introspective style, with careful attention to the costume details. His accurate portraits are never flattering but a sober and objective portrayal of his usual sitters: the gentry and lesser nobility. His style is easily identified by its coolness and restraint. In 1632 he was made Painter to the King, but his wife's fears of the approaching Civil War caused him to retire to Holland in 1643. He continued to paint for the rest of his life, but was reportedly ruined by the extravagance of his second wife and died a poor man in Utrecht in 1661. SIZE:34 x 29 inches inc. frame. *Christie's, London, 27 May 1988, Lot 98 (as Circle of Cornelis Jonson van Ceulen). Verso: damaged old label "140. C....... Portrait of a noblema.."
Oil on canvas in period giltwood frame. LADY MARY MONTGOMERIE was the daughter of Hugh Montgomerie, 7th Earl of Eglinton and Lady Mary Leslie. The title of Earl of Eglinton has been held by the famous Scotish family of Montgomerie since 1508. The Earl of Eglinton is Hereditary Clan Chief of Clan Montgomerie. Lady Mary was married in 1662 to George, 4th Earl of Winton, thus becoming the Countess of Winton. The marriage feast was held at her father's house in the West Country on 4 September 1662. 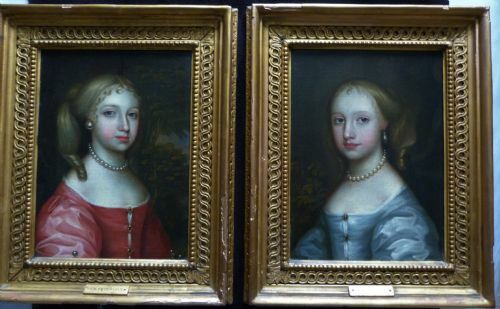 Lady Mary had one daughter, also Lady Mary, who died aged three in 1666. The black mourning band decorated with large diamonds almost certainly commemorates the child's untimely death. The Countess of Winton died in 1677. (Our thanks to Christopher Sheppard, a descendant of the Earls of Wintour, for his help in research). SIZE: 43 x 34 inches inc. frame. PROVENANCE: By descent to the 14th Earl of Kintore of Keith Hall, Aberdenshire. Verso: old inventory label "The Earl of Kintore. No. 53 on Oct. '83 valuation". Oil on canvas in walnut frame. This is a rare, charming and intimate double portrait...its rather naive quality is particularly endearing. The children are clearly of noble birth and are dressed in extremely expensive clothing. Quite what important event is recorded here is not known. It is possible that they are brother and sister but much more likely, despite their apparent facial similarity, that this is a marriage portrait commemorating the union of two powerful dynasties. The conjoined hands state the chief message of this picture. The children's expressions show that they are aware of the solemnity and importance of the occasion being recorded. The girl wears, suspended around her waist, a large piece of jewellery...rubies, emeralds and pearls set in gold. It is so large as to be almost out of scale for the little child; it is likely that this was a marriage gift from the boy and is of a size to be a brooch for an adult. Sir Anthony van Dyck's marriage portrait of the ten year old Princess Mary of England and the fifteen year old William, Prince of Orange shows her wearing just such a jewel, a gift from her husband. Older and taller than our sitter, Mary wears her brooch at the neckline of her dress. Marriages of children in order to secure unity and as a political move was quite common amongst the great and powerful. After the ceremony the children would go to their separate homes to meet again and live as a couple when mature. SIZE:21.75 x 25 inches inc. frame. PROVENANCE: The Melton Fisher Collection, Suffolk. Oil on panel in reproduction 'cassetta' frame of appropriate type. 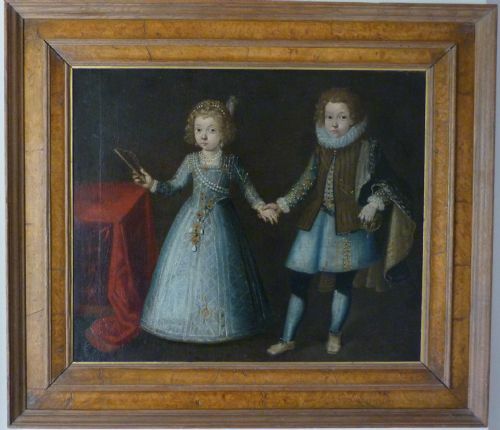 Probably a marriage or betrothal portrait, painted in 1611 by a Follower of Van Mierevelt. Almost certainly Flemish or Dutch, the young aristocrat, wearing the rigid Spanish fashions of the time, is depicted looking distant, aloof and of a subdued high-class distinction. The young woman, aged 17, wears expensive and fashionably slashed clothing along with a fortune in jewellery to further demonstrate her status. This portrait would probably have been commissioned to commemorate a dynastic union of great and powerful families, her coat of arms is prominently displayed along with her age, 17, and the date 1611. At this time Spain controlled a large area known as the Spanish Netherlands, it was a portion of the Low Countries under their rule from the sixteenth to the eighteenth century. This region comprised the Netherlands and modern Belgium, Luxembourg as well as part of northern France. Michiel Jansz. VAN MIEREVELT, Mierveld or Mireveldt (1567 - 1641) was a Dutch Golden Age painter. His portrait style was extremely influential and he painted for most of the European Courts; he was much emulated. SIZE: 35 x 30.75 inches inc. frame. Painted in the late Georgian period, the boy and his pet spaniel are in a flower filled landscape; his hoop and stick in his right hand, it seems as if the two have just paused on their way to play. The identity of the sitter is not known, but clearly he is from a wealthy family...the clothes and the fact that the portrait is full-length testify to that. After some years in London he moved to Norwich, then a very important city, where he enjoyed a good practice painting conversation pieces, and life size portraits from c.1783. He returned to London in 1787 and worked from Brook Street; he became extremely successful and moved to Hill Street, Berkeley Square, then to Hanover Square and ultimately to Harley Street. SIZE:55 x 36 inches inc. frame. PROVENANCE: Private Collection, Holland Park, London. The two sitters are most likely members of the Howard of Effingham family. The Howard family is an English aristocratic family founded by John Howard who was created Duke of Norfolk (3rd creation) by Plantagenet monarch Richard III of England in 1483. However, John was also the eldest (although maternal) grandson of the 1st Duke of 1st creation. The Howards have been part of the peerage since the 15th century and remain the Premier Dukes of the Realm in the Peerage of England, acting as Earl Marshal of England. William Howard, 1st Baron Howard of Effingham (c. 1510 – 12 January 1573), was the founder of the Effingham branch of the family, he was the eldest son of Thomas Howard, 2nd Duke of Norfolk by his second wife, Agnes Tilney. Howard served four monarchs, Henry VIII, Edward VI, Queen Mary and Queen Elizabeth, in various official capacities, most notably on diplomatic missions and as Lord Admiral and Lord Chamberlain of the Household. REMIGIUS VAN LEEMPUT (1609?-1675) was a highly accomplished painter working in seventeenth century England, and a celebrated small scale copyist of the works of Sir Anthony Van Dyck (1599-1641) and Sir Peter Lely (1618-80). Leemput was baptised in Antwerp in 1607 and by 1635 was living in Covent Garden, London, which is when, perhaps, he began working in the studio of Van Dyck, who arrived in England three years earlier. Very little is known about the pupils who trained and worked with Van Dyck, although it is generally acknowledged that Leemput was employed to assist with the preliminary development of his works and also as a copyist. He copied many portraits by Van Dyck, and told Sir Peter Lely that he could copy his portraits better than Lely could himself. Van Leemput died in 1675, and on 9 Nov. was buried in St. Paul's, Covent Garden. SIZE: 16 x 13 inches inc. frame. PROVENANCE: Private Collection, a Northamptonshire Country House. Verso: an old, handwritten label , badly torn " No.1 .....Howard..Daught(er?) ..Lord Effingham Howard. Sir P.Lely'. Both paintings bear the chalk inscription 'Hemsley'.